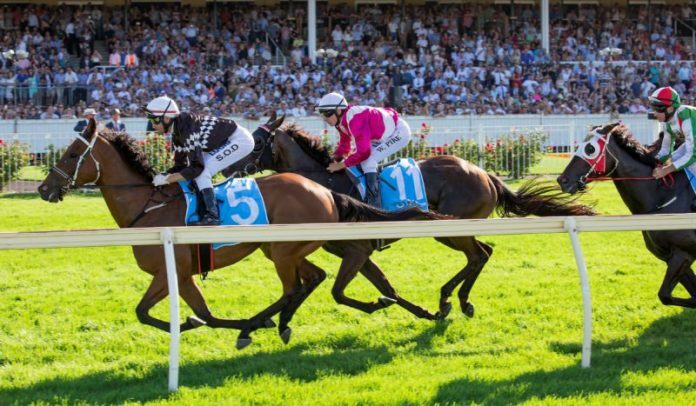 The Spring Carnival is done, but don’t despair: Group One racing goes west with this year’s edition of the Railway Stakes boasting a nice mix locals of interstate raiders. I reckon this year’s version is probably one of the strongest Railways they’ve had. I’d actually rate this very closely to the Toorak Handicap. Black Heart Bart and Scales of Justice add a lot of quality to it and it’s a very open race. There is genuine speed in the race through Great Shot, who’s the likely leader, as well as Supply And Demand, who’s drawn off the track. I see they’re undecided about what they’re going to do with regards to tactics, but I’d be very surprised if they didn’t utilise his tactical speed and go forward and try to slot in somewhere near the front. Going back from there would just about be game over for him. So that’ll inject speed, and inside of him you’ve got Scales of Justice and Material Man, who’ll roll forward, plus Tom Melbourne who’ll hold his spot. So they’re going to go hard early. Once they get their spot they might sit up for a little bit, but it’ll be genuinely run. Comes into this with 55 days between runs. The key run for him here is his second placing in the Memsie – the horses that’ve come out of that are Tosen Stardom (won the Mackinnon), Hey Doc (who the Manikato) and the winner, Vega Magic. He’s been set for this race. He’ll have to defy history to win it by carrying the top-weight, but he’s a warrior. He stands up in big races, and I don’t think the weight will stop him. He’ll get a nice run behind the speed and probably settle fifth or sixth one off the fence. He will be camped in behind the hot speed, and will be able to pounce when they straighten. He’s right in it and will be awfully hard to beat. I don’t think he’s going as well as he did this time last year when he won this, and he has to carry 4.5kgs more. I think he’s a genuine risk. It’s hard to win these races when you’ve had a setback like he did in Melbourne. I think you need everything going your way to win these races so I’m taking him on. He’ll look the winner at some stage! He hasn’t won since March 2016 in the Albury Cup on a heavy track. In saying that, he’s raced in the very best races possible in Melbourne and Sydney this time in and he actually gets his chance to win one of these races. Especially with the soft draw, Ollie just has to get him some clear air in the straight and if he can get the run through he’ll look the winner. You actually can’t fault his form: he’s been second in two Group Ones this prep, both over the mile. This is his trip and he gets his chance. If he had have drawn a gate I would have him a lot shorter. I really think that’s going to stop this bloke. They’re in two minds how they’ll ride him, but as I said I’d think they have to go forward. But he’s going to be asked to do an awful lot. I think he’s a risk at the trip in this class. I thought he was just plain at Flemington over the 1400m – he was every chance and just didn’t finish strongly. The late splits there tell me that he’ll battle to get the mile. Will lead and give a good kick into the straight, but there’s maybe just a bit too much pressure for him early doors to hold on. Has got the wizard on. She’s very one dimensional in the sense that she’ll get back and give them a start. Pike’s obviously good at weaving a path through. He’ll ride for luck, and if they get the breaks then she’ll be there in the finish. Bit of a funny ride last time out, he was taken to the front and ridden upside down at a fairly solid speed. He generally likes to get cover so I think from out wide Williams will have to go back here. It’ll be interesting to see how he goes on this surface because all his form is on soft tracks. I’m prepared to risk him here. I’m not a fan when the bar plates go on again. She was okay last time out and her late splits were good. She’ll get back and give them a bit of a start and will be one hitting the line late. He ran 11th in this last year, and he was in much better form then. I think he’s out of form and would have to lift dramatically. Derby winner from the autumn. He was good winning last start, he sat wide and was strong over the 1800m, and you know he’ll appreciate a good tempo. He’s a blow-out at odds… he’ll be hitting the line very hard. Has gone forward in softly-run races in his last two, but he’s not going to get that here. It’ll be a high-pressure race so I’m happy to risk him. He was okay in the Sale Cup but I think he’s outclassed here. Returned in very good order, winning over the 1400m the other day, and flies at Ascot. I think he’s tremendous value. Was very good in the Toorak with very good splits. Was just okay in the Cantala but in saying that, Tosen Stardom finished on his heels and then went out and won the Mackinnon, so the form is okay. No weight on his back here, local jockey on him… I’ve got him as a top five finish. Guineas winner last year. He’s crying out for the mile, but I’m not sure he’s going as well as he’s capable of. Still running well, but I think he might be a bit unders. I’ve left myself wide open here… I’m going Tom Melbourne from Black Heart Bart. Best value for me has to be Pounamu each-way. If you’d like to make the same bets as a pro punter, WA Winners is open to new members, so sign up now. Plus, our profit guarantee offer for our three month membership – turn a profit or get your subscription doubled for free – ensures you can’t lose!